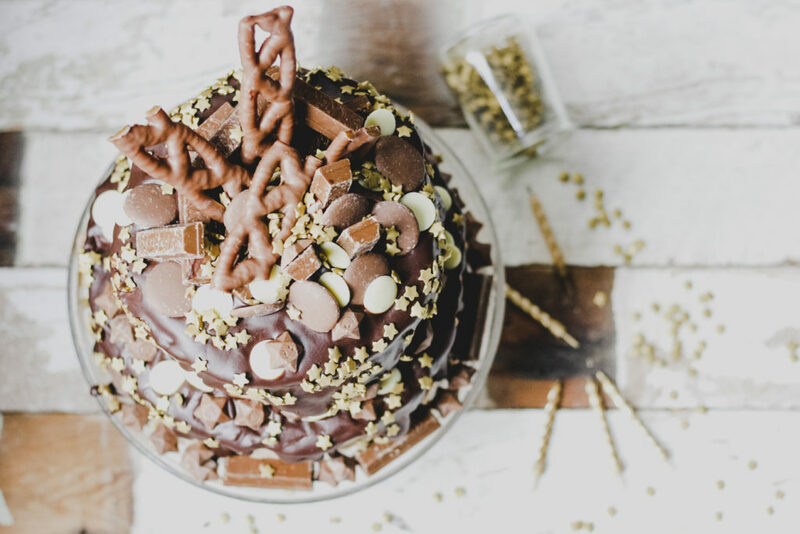 If you’re wondering what cake to make for your child’s birthday and want to make everyone go “ooooh ahhhh” with your epic baking skills, then this is the ultimate chocolate birthday cake recipe to keep in your archives. I asked Arlo what cake he wanted for his 8th birthday last week, which is always a nerve-wracking moment in any parent’s life. First of all he said “I’d like a PlayStation cake”. Hmmmmm not convinced about that one… all that black icing, and as for trying to craft controllers out of fondant icing?! It’s a no from me. What else Arlo? Hmmmm how about a MASSIVE chocolate cake. Ah yes, now that I CAN do! I’ve been admiring the trend for chocolate drip cakes for quite a while now, and this seemed like the perfect opportunity to have a go at creating one myself. I absolutely love Sarah at Taming Twins Chocolate Explosion Cake so I used that as my inspiration. Now to design my own recipe. I popped into baking experts Lakeland for a bit of cake tin advice and came away with two 8cm deep tins – one 20cm and one 15cm. I didn’t really want to be faffing about making four cakes to stack up, so thought this might be a good shortcut and involve fewer layers of sickly buttercream. I then consulted the web to do a bit of cake maths so I could figure out how much cake batter I needed for each tin, and then designed my chocolate cake and frosting recipes for maximum chocolatey enjoyment! As well as the standard cocoa powder in the sponge, I’ve also added milk chocolate chips to give that extra dimension of smooth chocolate texture. I wanted to keep the frosting pale in colour so that it would contrast nicely against the dark chocolate ganache, so I added a little cocoa powder as well as some malted drink powder for extra yum factor. I’m going to be honest. This is not a quick cake to bake, you need to set aside the best part of a day to get this baby ready. In fact I’d recommend baking the sponges the day/night before you decorate them, so that they’ve cooled down sufficiently. I ended up putting mine in the fridge to speed things up. However this isn’t a complicated cake that requires a huge amount of skill or precision when it comes to decorating it. I used plastic drinking straws pushed through both sponges to hold them together so I wouldn’t end up with a wonky masterpiece! I don’t have a fancy cake turntable or smoothing tool for immaculate buttercream application either – I just used a good old fashioned palette knife and kept going until it was as smooth as I could get it. I’m not a perfectionist at all with baking. I like things to look pretty, but I’ll never be a super neat and precise baker when it comes to decorations. The ganache that gives you that beautiful drip effect is super easy to make, you just need to make sure you let it cool a little before putting it on the cake. I spooned mine into a large disposable icing bag and snipped off the end. This allowed me to control where the drips went. Then it was just a question of encouraging it off the side of the cake with the back of a spoon. The crucial thing to remember is to chill the cake sufficiently after you’ve applied each layer of buttercream. So when the warm ganache runs down the side, it doesn’t just run off! When it comes to the toppings, just use your favourite types of chocolate. Fun size bars are great, colour-contrasting white chocolate drops work well, as do the towers of curly wurly. A final flourish with some gold star cake sprinkles which I literally threw at the cake and there you have it – the ultimate chocolate cake to end all chocolate cakes!!!! Grease and line a 20cm cake tin and a 15cm tin - both 8cm deep. Pre-heat the oven to 180C/160C fan/gas 4. 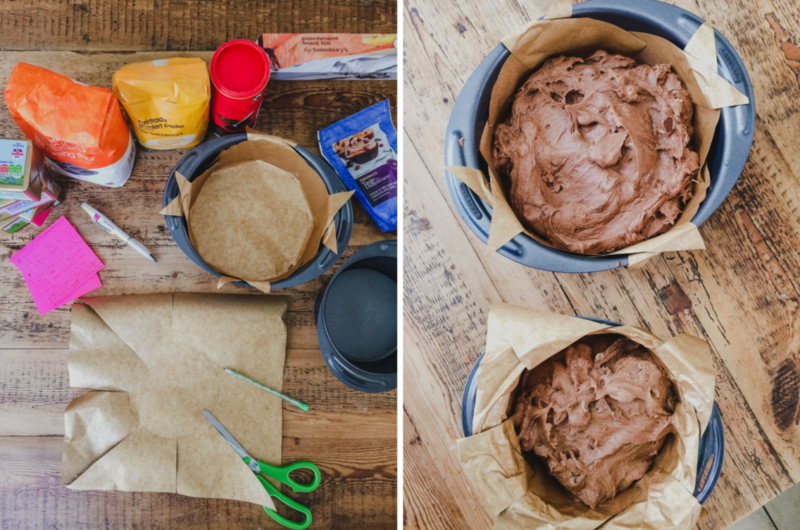 Make the batter for each cake in a separate bowl so you can keep the amounts correct. Beat the softened butter with the caster sugar until light and fluffy - using an electric mixer will make short work of this. Add the eggs one by one, beating until combined. Gently fold in the flour, cocoa powder and chocolate chips, making sure the batter is smooth and all of the ingredients have been thoroughly mixed in. Turn out into the cake tins and smooth the batter into place. Bake in the oven - setting the timer for about 40 minutes. The smaller cake will be ready first, the second cake about 15 minutes later - all ovens vary though so just keep checking by popping a knife into the middle of each cake. As soon as it comes out clean, the cake is ready and can be transferred in its tin to a cooling rack. Then 5-10 mins later carefully lift out of the tin and let it sit directly on the cooling rack. If you don't have much time you can pop them in the fridge to speed the process up. While the cakes are cooling, make the frosting by beating together the butter, icing sugar, malt powder and cocoa. Keep adding a tablespoon of milk at a time until you have a super smooth frosting that'll spread easily. Set to one side until you're ready to construct the cake. Once the cakes are completely cool, gently take them out of their greaseproof paper and place them on a large chopping board. Trim off any lumps and bumps off the sides and top to give a smooth surface to ice. Place the larger cake on your cake stand and then spread the top with a layer of buttercream, then stick the smaller cake dead in the centre on the top. To keep the cakes solidly together, poke three plastic drinking straws through the top cake into the bottom cake. Snip off the tops so they're not visible under the icing and don't forget to remove them once you start slicing later on! You can now use half of the buttercream to liberally spread all of the visible surfaces of both cakes. Use a palette knife or whatever you find easiest. Once you've applied the first layer, smooth it around - it doesn't matter if you can still see the cake through it at this stage. Then pop the whole thing in the fridge to chill for 30 minutes. Repeat this process again with the remaining frosting - you might not use it all but you can easily pop it in a pot and freeze it to use again in the future. Again add the top layer and then smooth and smooth and smooth it as much as you can. Chill again for another 30 - 60 mins. Now for the fun part! Heat the cream up in a pan until it starts to bubble at the edges, then remove from the heat. Add the chopped dark chocolate and mix until you're left with a thick and glossy ganache. Allow it to cool a bit until it's body temperature - if it's too hot it'll just slide right off the cake! If you have one, pour the ganache into a disposable piping bag, snip off the end and then pipe a layer around the top exposed edge of the cake on the bottom layer. Use the back of a teaspoon to gently encourage the drips to go down the side of the cake. Because the frosted cake has been chilled it means the drips will set more easily. Then flood the top of the cake with ganache, and again using the back of a teaspoon push a little drop at a time over the edge to create the drip cake effect. Any leftover ganache can be chilled or frozen to use again. Once you're happy then liberally decorate the the top with your selection of chocolate bars. Chopped up shards of curly wurly look impressive, as do contrasting white chocolate drops. Just go crazy and don't worry too much if it doesn't look perfect. I added a final dusting of edible gold stars to make it look extra special. Pop the whole thing back in the fridge to set and then bring it out an hour or two before you're ready to serve so it softens up a bit for eating. 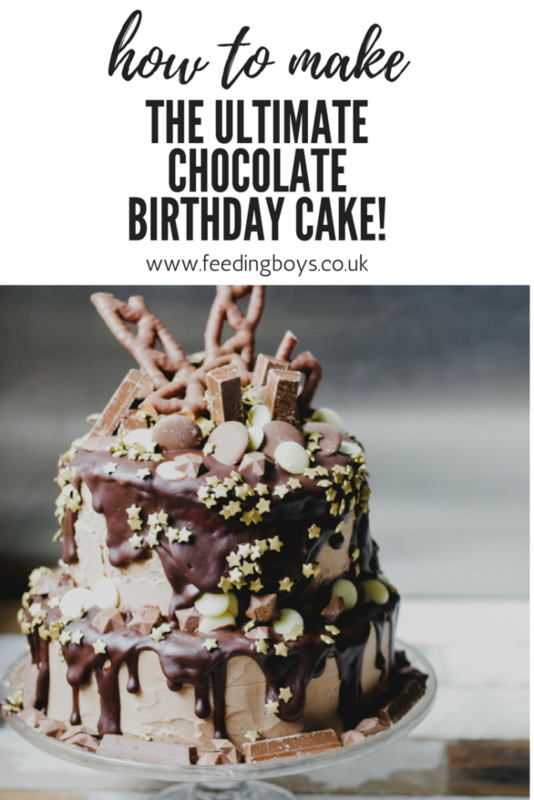 Slice and enjoy and soak up the glory of having made the ultimate chocolate birthday cake! Because the cakes are so deep, they do take twice as long to cook as shallower sponges. If you find them going too dark on top while you're baking them, simply cover the top with foil so they don't burn. So that’s another birthday done and dusted – I cannot believe my baby boy is eight! It’s always exhausting getting everything ready in time, but seeing their eyes widen at the sight of all that chocolate cake certainly makes it all worth the effort. Now I just have to resist nipping into the kitchen and shaving slices off surreptitiously while I’m working from home and no one can see me! WOW!!! FABULOUS, what more can I say?? That’s why it took so long, but well worth the effort!! Such an amazing creation and I’m sure the birthday boy was very happy indeed. 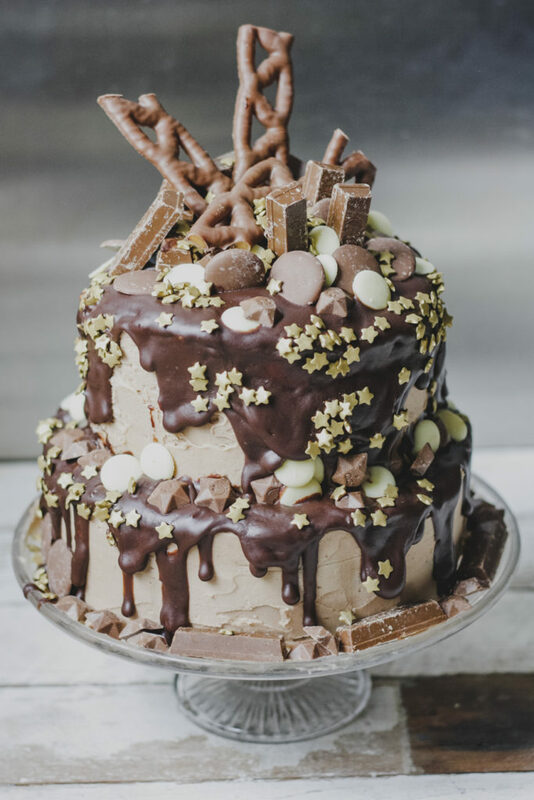 I’ve got a three year old chocoholic to bake for soon so I might give this a go! Heheheh I’m sure he’ll be delighted Ren!!!! hehehehe if you don’t mind driving to Whitley Bay to collect it?! Oh.em.gee. This looks EPIC! A real celebration cake! It really was an epic creation! This looks like such a good cake, so effective. I love the ganache drips, I think it works well and means you don’t need to have perfect edges. I imagine most children and adults alike would be delighted to have this on their birthday. Just made this cake, and wow, its amazing. I bake for a living, and I have struggled with chocolate cakes, trying to find one that’s moist, chocolatey and decadent, but this is it. Oh wow thanks Melissa that’s fabulous to hear that you’ve made it and loved it – hurrah! Honestly I can’t imagine ANYONE not being delighted with this as their birthday cake (unless they’re one of those freaks who don’t like chocolate!) — it’s so beautiful. Happy belated birthday to Arlo! Oh my lordy! this looks amazing and is quite torturous for me to look at as I’m on a major summer holiday diet! Hope he enjoyed his cake!! That is quite sensational, never mind for a child, I would love someone to make that for my birthday! I’m going to try and make a mocha one for my birthday in July…. Can you adopt me sometime around my birthday please? What a gorgeous confection! now THAT’S a birthday cake! I hope Arlo appreciated the effort you made on this magnificent structure, as it is AMAZING! I love that you consulted the internet for cake maths. I’ve done that too. 🙂 Not to such fabulous effect though. Cake maths is the only maths I like to engage myself in Kellie! YUP! Katie, you win! 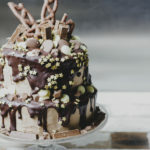 That IS the ultimate chocolate birthday cake and one that I could easily devour, in a trice! This looks amazing Katie. What an awesome mum (and baker) you are. Good morning Katie, I’m going to try and make this cake for my sons birthday. How do I store this cake if I make it the day before? sorry for the late reply… I would bake the cake in advance, but assemble and decorate it on the day otherwise it’d be quite awkward to store it fully made up.